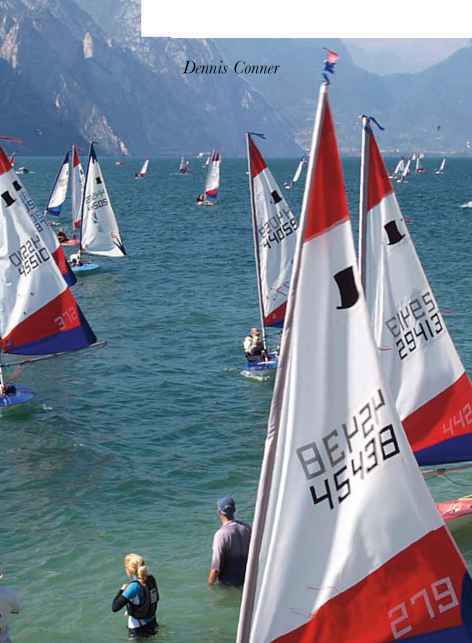 Popular single-handed dinghies such as the Laser, Topper, and Pico all have similar rigging, which is simple and quick to assemble. With practice, you should be able to get one of these boats rigged and ready to sail in about 15 minutes, though you may need help lifting the mast. The principal feature of all these dinghies is that they have no shrouds or forestay to support the mast. Instead, the mast is self-supporting, with the lower part fitting into a tubular mast step in the foredeck. The unstayed mast does not provide the same level of control as a fully stayed rig. it will bend and flex with the wind, but it maintains sufficient stability for the helmsman to manage the sail. 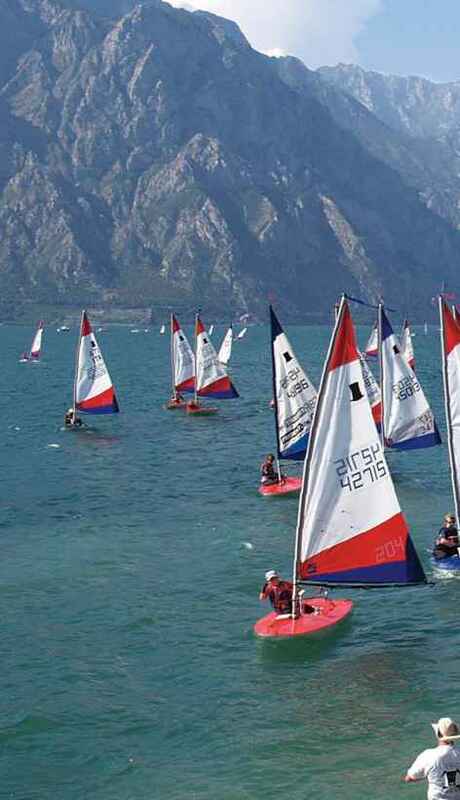 Most of these dinghies have aluminum or fiberglass masts that sleeve together in two halves, which is ideal for storage or roof-rack transport. instead of being pulled up a track in the mast, the sail has a luff sleeve that slides over the mast. A line is stretched across the rear deck, to form a traveler connecting the mainsheet top and bottom blocks, while allowing the boom to swing. Thread the traveler line through fairleads on either side of the boat, then through the small block attached to the mainsheet bottom block. Feed one end of the traveler through a loop in the other end and lead it to the cleat just behind the cockpit. The traveler is now complete. 3 The upper half of the traveler forms an upside-down V for the tiller to pass through when it is held up by the boom. Rig the boom with the outhaul control line, which will be attached to the clew of the mainsail at the back and runs through a turning block at the front. 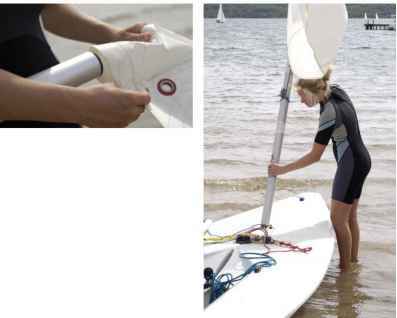 Check your dinghy's rigging manual before you start to assemble the boat. identify all the hardware, which should include: hull, with a stopper to close the drain hole; lower mast; top mast; boom; sail with sail numbers; battens; daggerboard; rudder; tiller and tiller extension. 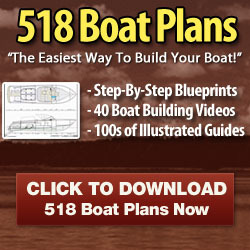 rope sets and equipment should include: mainsheet and blocks; traveler line and blocks; kicking strap (vang) line and blocks; outhaul line; cunningham line and blocks; daggerboard restraining shockcord. 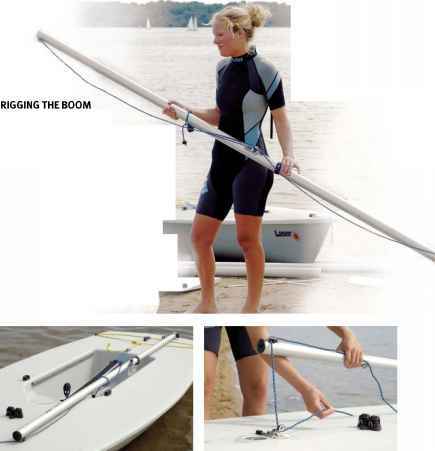 2 Make sure the boom is the right way around, with the gooseneck fitting at the front where it attaches to the mast and mainsheet fitting at the back. 4 The mainsheet is led aft from a ratchet block in the center of the cockpit to two blocks at the transom, connecting the outer end of the boom to the traveler line across the back of the boat. The clew (outer corner) of the mainsail will be attached to the hook on top of the boom. 3 The outhaul line is led down to a turning block on the deck and back through a jamming cleat by the cockpit. It can be loosened to allow a fuller sail shape when sailing downwind. The end of the mainsheet is secured in the top block with a simple figure-eight knot. Face the boat h ead to wind before rigging the sails. Rig with the bow of the dinghy facing into the wind. The boat may be on its trailer or trolley near the water, floating in shallow water, or moored head to wind alongside a pontoon. Assemble the mast by slotting the two sections firmly together. Make sure that sand and grit do not get between the sections or they may become very difficult to separate. Ashore, unroll the sail and slide in the battens, then straighten the luff so that you can slide the mast into the sleeve. Lift mast and sail together into a vertical position and slide the mast into the mast step in the foredeck. 1 Assemble the two parts of the mast. Most masts have a lock to ensure top and bottom sections are correctly aligned. Make sure the sections are firmly engaged. 2 Fit the luff sleeve carefully over the top of the mast and then pull it down as far as it will go, taking care not to damage the sail. This may be easier with two people. 3 Slide the sail battens into the batten pockets. 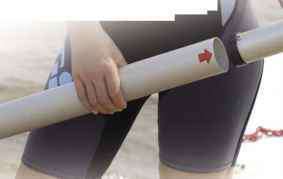 Tuck the outer end of each one under the fold in the sail cloth to hold it in place. Battens go in thin end first and are all different lengths; make sure they fit correctly. 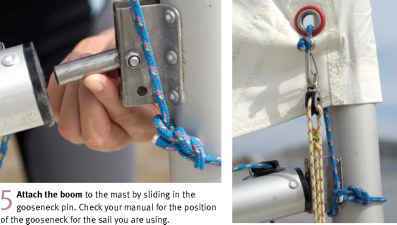 ■ Lift the mast and sail, and push the mast base right down into the tubular mast step. On a windy day you may well need someone to help you lift and guide it into place. 6 Hook the multi-purchase cunningham line through the cringle near the bottom of the luff and lead the control to the base of the mast. 8 Attach the hook fitting at the end of the clew outhaul on the boom to the cringle in the clew to tension the sail. Fit the rudder to the transom with the rudder blade lifted, pushing the rudder case down until the pintles are locked by the safety clip—this ensures the rudder cannot fall off. Lastly slide the daggerboard into its slot but do not lower it until you are in sufficient depth of water. 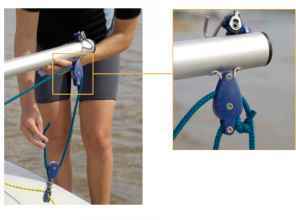 Always secure the daggerboard to the boat with the shockcord safety retainer or you may lose it if the boat suffers a capsize. 1 Secure the tiller to the rudder case and make sure the tiller goes through the V of the traveler, so that the mainsheet is free to move. 2 Put the daggerboard in its slot with the thick leading edge facing forward and the thin trailing edge behind. Secure it with shockcord. once you have done all hard to beat." in your power to win. you're going to be hard to beat."